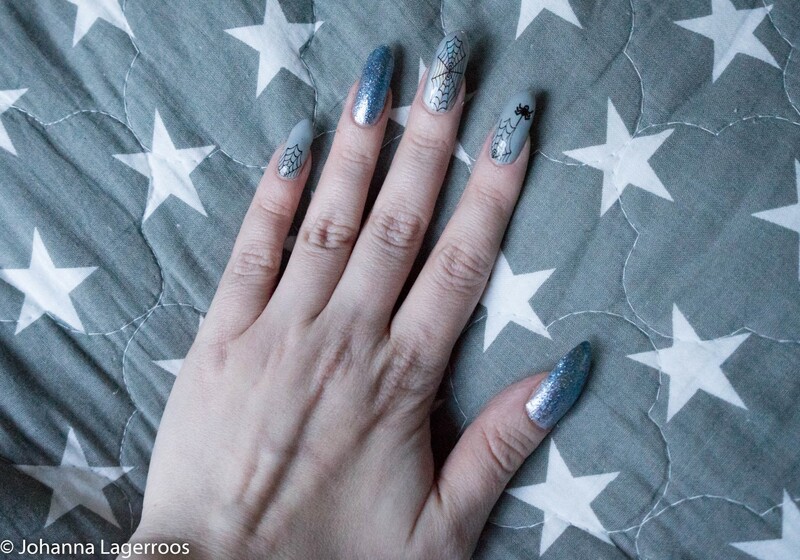 New Blogoween, new nail designs. You know it's not Halloween without me creating fun nails to go with the occasion. I've tried my best to keep these simple so that more of you would be encouraged to try to recreate them. 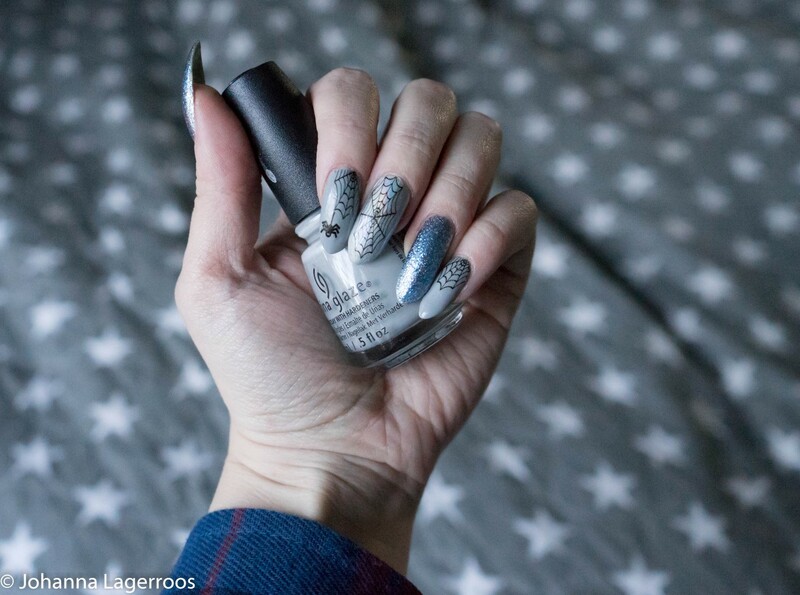 Because nail art isn't very hard, you only need good-quality products, little time and patience - and like with any art, some practice. The first design this year is spider nails. I did ones last year as well (see the tag "Halloween" for all the previous Halloween post throughout the years! ), but I feel like this can be done in so many different ways that you can't really get too bored with it. This year, I chose a grey/silver color scheme for the design, so that it would be quite far from the warm toned one last year, but also so that the decals would show better. 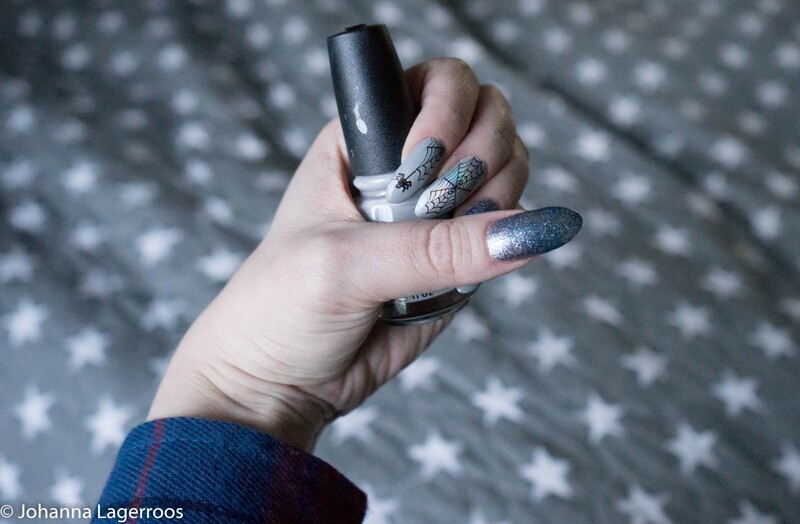 I added glitter accent nails to make the design more glam, and if you look the pics closely enough, you'll notice that the middle finger nails are actually holographic. Because life is too short to not have some holo. The polishes I used were Street Srtyle Princess and OMG! by China Glaze and Shine For Me by O.P.I. The decals (spiders and webs) are from Shop Keeki, and I also used base coat and top coat by Glisten & Glow. I'm actually really happy about how these nails turned out, and more I look at them, the more I like them. And I really hope you like them too! 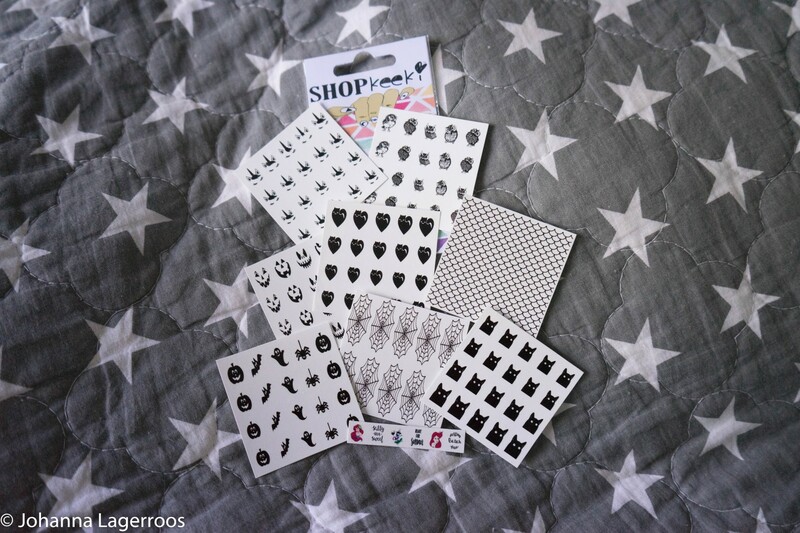 Now, I have to share all the decals I got from Shop Keeki in July for this series (and more). 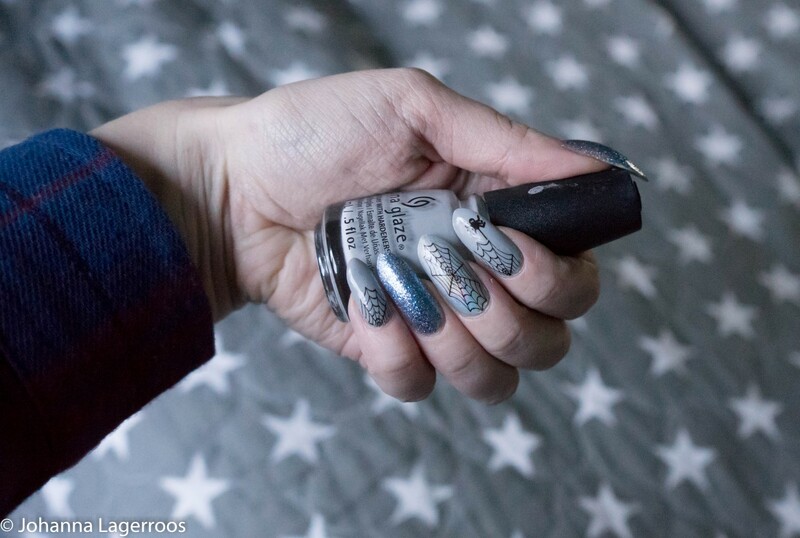 Shop Keeki is my go-to shop for nail decals, as the quality is on point, the designs are super fun and the delivery very fast - at least to Finland since the shop is located in the UK. You may have spotted some of these on my Insta already, but I've tried my best to keep the designs to myself until this month, so that you would have surprise content for the whole month (excluding couple of little sneak peeks). 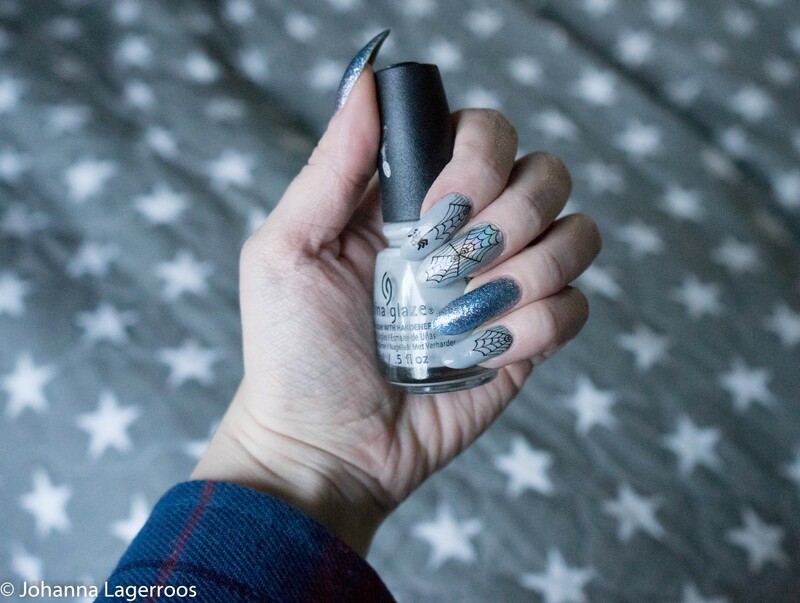 What do you think about today's nail design? Let me know in the comments! Thanks for joining today, I hope you got at least a little bit inspired by the design today, and that you will be joining for the other Blogoween posts coming up. If you want to get notified about my posts, follow me on any social media (Twitter, Instagram or Facebook), as I will let all of you know when the new posts are up! I'll see you all in my next post!